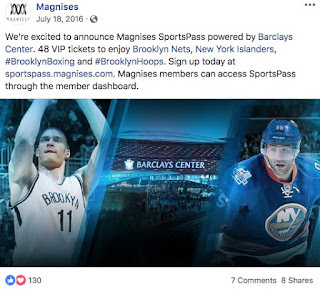 Billy McFarland Bought $100k Worth of Tickets from Barclays Center for Magnises, reported Dave Brooks of Amplify 1/28/19, citing evidence in a bankruptcy case. That means that the now-disgraced founder of the scammy Fyre Fest was looking for ways to market Magnises, his credit card for millennials. And one of the ways, as Brooks put it, that "McFarland blew through $26 million in investor money" was by paying Brooklyn Events Center $100,000 for tickets in February 2017. 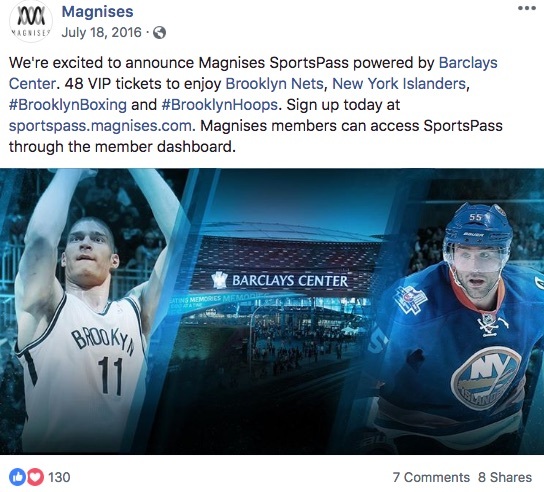 “We're exited to announce Magnises SportsPass, powered by Barclays Center, 48 VIP tickets to enjoy Brooklyn Nets, New York Islanders, #BrooklynBoxing and #BrooklynHoops," a 7/18/16 post stated (right). Interestingly, that was well before the actual payment to the arena operating company, so presumably there was a deal beforehand. Barclays Center didn't comment for the article, but it's not unlikely that the arena makes group-sale deals with various potential buyers (see: Craig Carton), and in doing so offers discounts. After all, especially by the 2016-17 season, neither the Nets nor the Islanders were selling all that well.